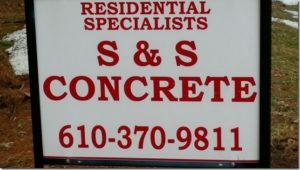 S & S Concrete is known for dependability, quality service, and professionalism. We serve the Reading, PA area and surrounding communities for ‘all things concrete’. Opened by Lew in 1985, we are a family-owned business providing service to residential and small commercial customers. All new concrete should be sealed with an anti-corrosive sealer. We provide this service too!